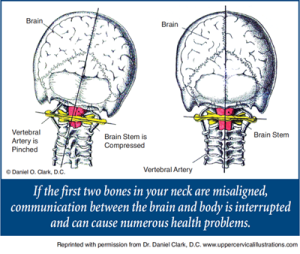 Home » What Is Upper Cervical? Upper Cervical Care is a rapidly growing form of natural health care that has helped millions of people regain and maintain optimal health. While western medicine tends to focus on the symptoms or effects (i.e. high blood pressure, high blood sugar, pain, etc. ), upper cervical care seeks to locate and correct the cause. Chronic health conditions and diseases are on the rise including migraines, asthma, autism, diabetes, epilepsy, fibromyalgia, acid reflux, hypertension, insomnia and more. The world is getting sicker with each passing year, in spite of the fact that we consume prescription drugs at an unprecedented rate. Amazingly, the United States represents less than 5% of the world’s population yet consumes nearly 75% of all the pharmaceutical drugs manufactured. We spend an average of $8,200 per person each year on health care, almost twice the average of the rest of the world. If this “traditional,” western approach to health care was the answer, wouldn’t the USA rank head and shoulders above other countries in overall health? According to the World Health Organization (WHO), the United States ranks 37th in overall health, below some Third World countries. We are over-treating ourselves and we won’t stop being sick until we stop making ourselves sick! Our current medical system excels at crisis care, such as the treatment of strokes, heart attacks or trauma. However, these cases only represent a small portion of today’s health concerns. The system fails miserably when it comes to prevention: keeping people healthy! Due to this frightening trend, a paradigm shift is occurring in our country. Patients are seeking natural alternatives; they believe that traditional health care should be held to a higher standard, that profits and politics should no longer stand in the way of good health. Many Americans are looking for a different model of health care, one that puts their entire well-being first. This “new approach” to health embraces the fact that the human body is a self-healing organism. We are created with the ability to heal and recover from almost anything and adapt to those things that we cannot. We are empowered to seek advice and ultimately make our own healthcare decisions, because we are the only ones who know what is ultimately best for us! Every healing profession acknowledges that the body has an inborn or innate ability to heal itself. By restoring these healing messages, your body will operate at its very best and heal itself from the top down and inside out. To schedule an appointment with Dr. Dallies simply click the button below.